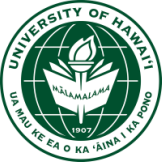 Charise Michelsen is a first year student in the MLIS program at the University of Hawaii at Manoa. She has a variety of interests but her primary focus is in archives and special collections. She works part time in the Special Research Collection, processing the University's unique historical material. 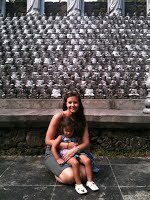 She is also an intern in the Asian Art Department at the Honolulu Museum of Art. Storm Stoker is a second year MLIS student, specializing in archives. Last year she was a Tsukuba intern in Japan over the winter break and received funding to attend that ATALM conference in New Mexico in June. She has a BA from UH Hilo in Anthropology, an MFA in set Design form UHM, and an MA in Cultural Communications from the University of Sussex in Brighton, England. Storm is an Anglophile and enjoyed her time in England and was able to tour Europe and Turkey. She currently works full time at UH Manoa and writes in her spare time, her newest novel Once Upon a Zombie, has been read by tens of people. She hopes to retire off the proceeds of her movie deal but is still waiting for Hollywood to call her. In the meantime she is thrilled to be VP of SAA and is looking forward to a great new year! Karen Kadohiro is in her second year in the MLISc program and is interested in archives and academic librarianship. She has a B.A. in anthropology and is working on finishing her M.A. in the same field. Karen enjoys eating, traveling, and spending time with her family and friends. Alicia Yanagihara is a second year MLIS student, specializing in archives/public libraries. She has a BA from UHM in History and a minor in Art History. She became interested in archives when interning at the Smithsonian’s National Museum of American History as an undergraduate. In her spare time, she enjoys traveling, going to the beach, and spending time with her dog, Ozzy.